The Oceanographic is the largest complex of its type in Europe. The Oceanographic intends to simulate different marine ecosystems. Integrated inside the cultural complex of The City of Arts and Sciences and opened in February 2003, The Oceanographic is the largest complex of its type in Europe. This aquarium intends to reproduce marine ecosystems. 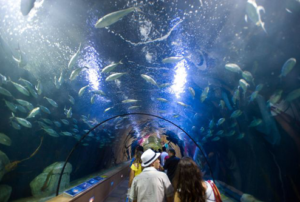 The park is divided into ten areas, each building houses a different aquatic environment: Mediterranean, Wetlands, Temperate and Tropical Seas, Oceans, Antarctic, Arctic, Islands, Red Sea and the largest dolphinarium in Europe. 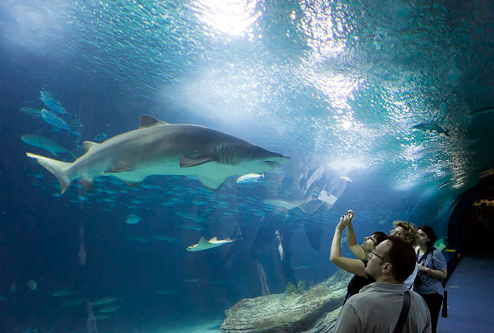 Dolphins and belugas, sea lions or walruses, sharks or rays, are just few of the species that populate this aquarium where more than 45,000 animals of 500 different species can be admired. Be prepared to spend at least 2-3 hours along the designed tour by Oceanographic or even more if you consider having a meal at the underwater restaurant, located in the center of the park.